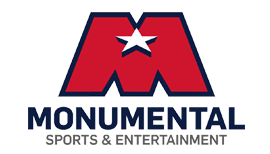 Monumental Sports & Entertainment’s mission is to be an unparalleled community-driven enterprise, to showcase the best teams and the best entertainment venues, while investing in and giving back to the greater Washington, DC region. To accomplish this we recruit, hire, develop, and retain exceptional and talented employees. We offer competitive compensation, comprehensive benefits, as well as an exciting and dynamic workplace. Join the Monumental Team today!